​Editor's Note: This article was originally published by the Uniontown Herald-Standard on Jan. 21, 2018. Krisa Walls of Georges Township was looking for a job to bring a second income into her home when she decided to apply. The stay-at-home mom raised three children over 20 years, and her last job was driving a school bus. "I wanted something with steady pay and benefits, and I couldn't really find anything around here," Walls said. "There's no favoritism. We are right there with (the men) — we can do what they can do." Browsing online, she saw the state Department of Transportation was looking for snow plow operators. Since she already had a CDL license from her bus-driving days, Walls applied, but found she was filled with self-doubt about the job, even when the instructor had her sit behind the wheel of one of the plow trucks. "I said I didn’t know how to do it," Walls said, but after driving one and two gears for her job interview, the interviewer said he believed she could do it. After driving the truck around U.S. Route 119 as part of the September interview, she received a call that night saying she landed the job and would receive training and start in October. Tish Libertino of Uniontown, a friend of Walls who also had her CDL license from driving a bus for 10 years, was also looking for a better job with better pay and benefits. After seeing signs about the need for snow plow operators and knowing Walls was a successful applicant, she decided to apply in November. "I was hired and started in the beginning of December," Libertino said. Both women went into the training with different mindsets. Libertino was confident; Walls was doubtful. "It was rough at first," Walls said. "In the back of my mind, I didn't want to do it." Walls and Libertino said they had great trainers to identify strengths and weaknesses in the new recruits and get them ready for the road. "I like doing it," Libertino said, adding that while some challenges came with the job, she said she was comfortable in control of the truck. "I like being on my own, and I like driving." "I was scared to death," Walls said about her first time going out during the first snowfall, saying she was panicking on the inside, but stayed composed and did her job as her foreman drove behind her and gave her pointers until she went back to reload. Then she was on her own and got used to the job. "In the end, I wondered how I did it." Both Walls and Libertino said working for PennDOT opened their eyes to many things the public doesn't see or know about snow removal from the roadways. "It's not as easy as everyone thinks," Libertino said. "There's a lot of things going on." The two said they have a newfound respect for that job as it's not just driving a truck. They need to know when to use salt, brine, or anti-skid materials and how much of it to use in conditions that are always changing; attaching 70-pound chains on their tires; cleaning out the back of the trucks. When there's no snow, they shovel, flag, perform maintenance work and any other jobs that need done. "There's no favoritism," Libertino said of the fact that she and Walls are women in what's considered by many to be a man's world. "We are right there with them — we can do what they can do." 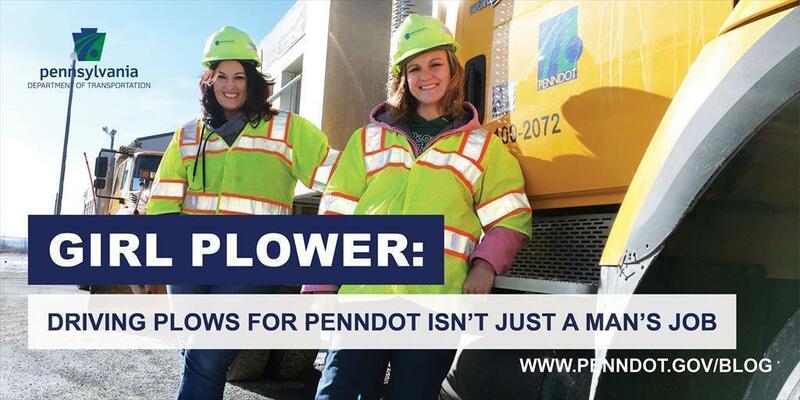 In fact, Valerie Petersen, the community relations coordinator with PennDOT District 12, said District 12, which covers Fayette, Greene, Washington and Westmoreland counties, is the district with the second-highest number of female employees. Walls said being a woman surrounded by many men at the job made her want to prove herself, and she has. "The guys see we can do it," Walls said, adding that people have taken notice when she's out in her truck and other women give her a thumbs up or ask how she does it. "If I can do it, anyone can do it." Both Walls and Libertino want motorists to know that safety is a top priority​. "You have cars that come up alongside of you when you're trying to work," Libertino said, adding there's times where they can hear salt bouncing off passing vehicles from their trucks that take up large portions of the roadway. "The public should know to keep their distance from plow trucks." Walls said such actions from motorists have caused them to turn off their salt spreaders, which makes it more difficult for them to do their work. "Their job is to make the roads safe for motorists," Petersen said, adding if the weather conditions are bad, motorists are asked to not go out unless they have to. Petersen said they're always a need for such jobs and those interested can look into applying by visiting www.employment.pa.gov and follow the link to PennDOT. "If I knew about this job a long time ago, I would have applied," Libertino said of the benefits available including retirement. "Lord knows this county needs jobs."